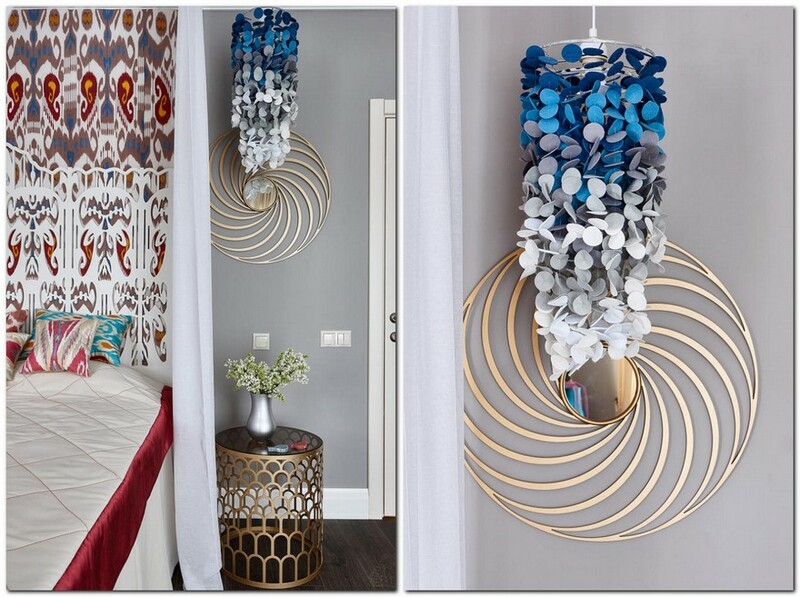 Hanna Yakupova, the interior designer who was in charge of this project, had been assigned a task, which was very interesting and challenging simultaneously. The house owners have a family tradition to design each room in an individual manner typical of some country of the globe. 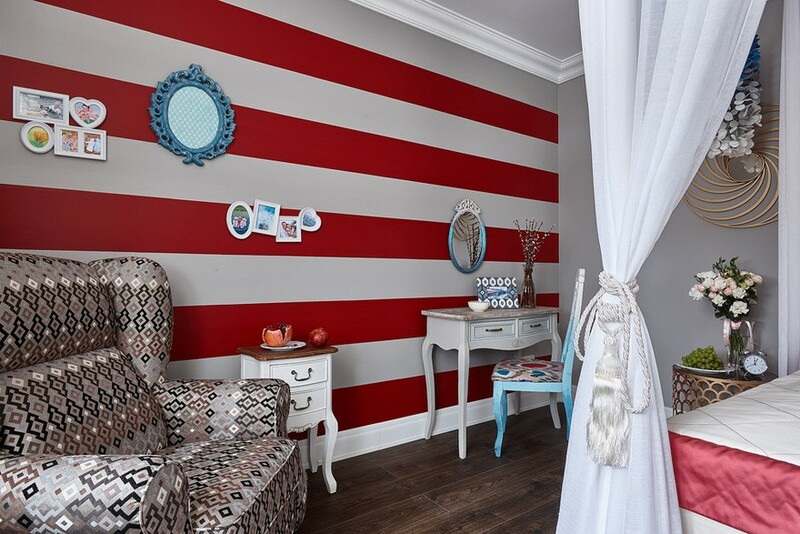 Thus, their kid’s room looks like a small France, and the living room embodies the image of Great Britain. As for the bedroom that we’d like to discuss in this post, it was meant to be more exotic. In particular, it was supposed to incorporate oriental motifs. Uzbek, to be precise. 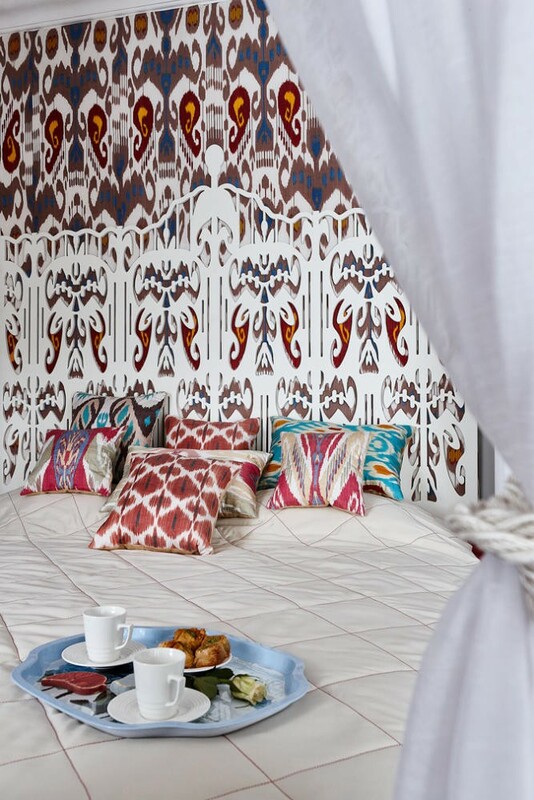 Back in January, at Maison & Objet 2017 exhibition, Hanna was tempted by ikat pattern. Ikat is primarily Uzbek ancient handcrafting technique for making textiles of top quality with specific ornaments. Now ikat ornaments are used for dyeing tableware, decorating wallpaper and as a pattern for wood carving. And Hanna made up her mind to show ikat in her new project to the maximum. For a start the color scheme was picked: quiet pastel shades as a neutral background, bright pomegranate red as a dominating accent and, of course, multicolor, yet not too motley ornaments. Chosen as a centerpiece of the interior was the bed and the wall behind it in particular. 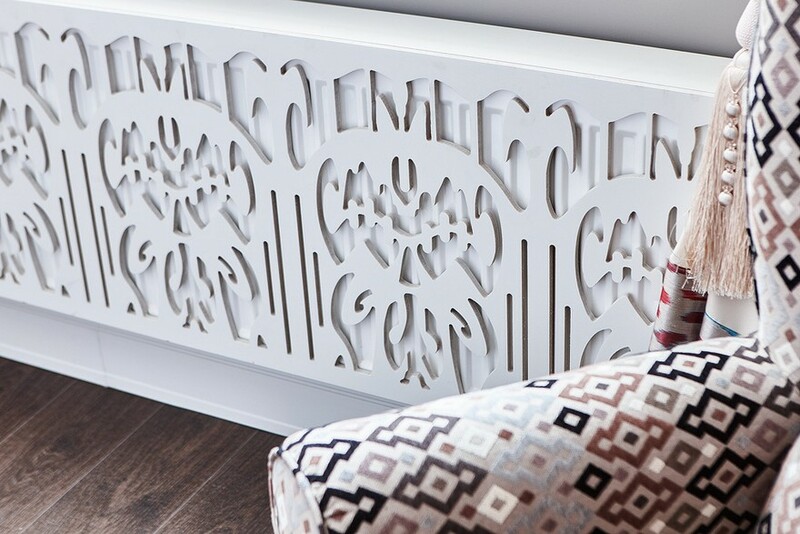 The latter was decorated with bespoke handmade fabric, and its ornament was precisely replicated in the headboard via laser cutting technique. Such a perfect match creates an incredible effect: a flat ornament seems to be flowing from the wall and becoming kind of “living”, three-dimensional. Interiors created by qualified designers are always recognizable by the presence of matching details that appear in different corners of a room and link to form the general interior concept. 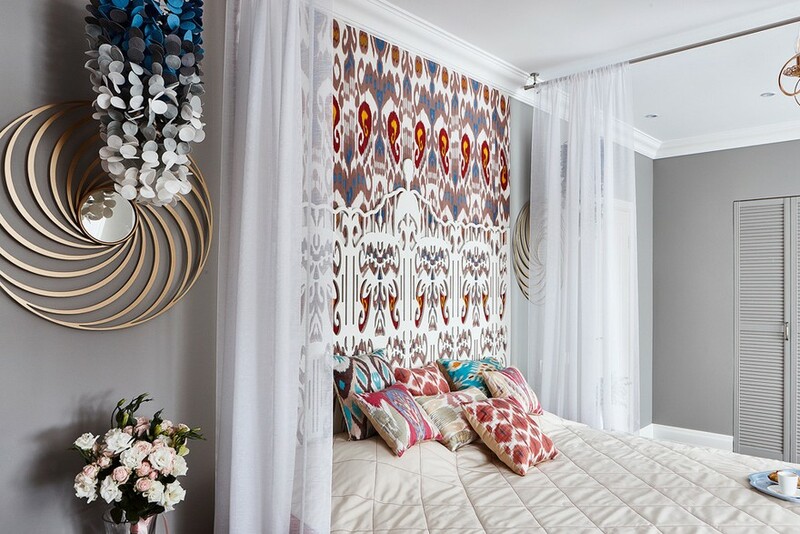 It’s the same thing here: we can see ikat in many other interior elements: latticework of a radiator cover, chair seat upholstery, curtains trimmings, throw pillows and even photo frames. But the most eye-catchy detail featuring a famous Uzbek ornament is a faux fireplace. 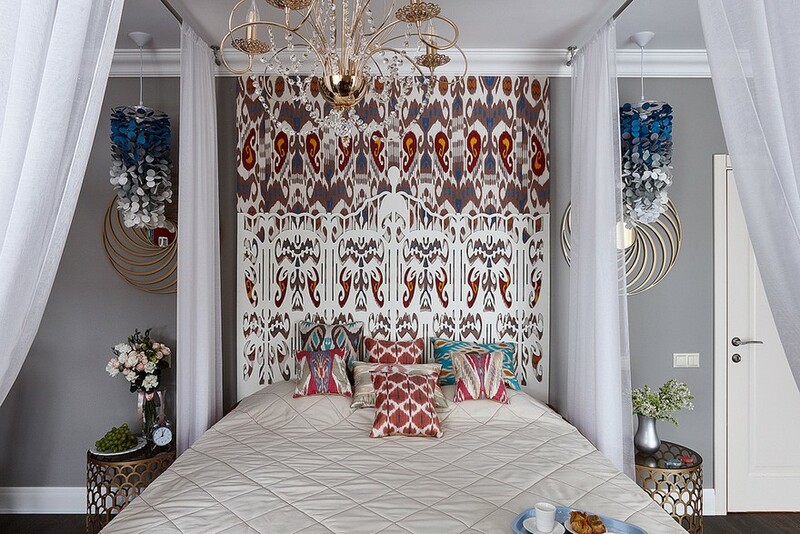 Inside it’s finished with mosaic tiles that ideally replicate the pattern of the headboard zone. But original designer ideas do not end there. Especially for this bedroom Hanna has handmade a couple of lamps. It took hundreds of multicolor felt circles and many hours of tedious work, but the result is worth these efforts. Lovely soft gradient effect smoothes the intensity of the pomegranate hue. 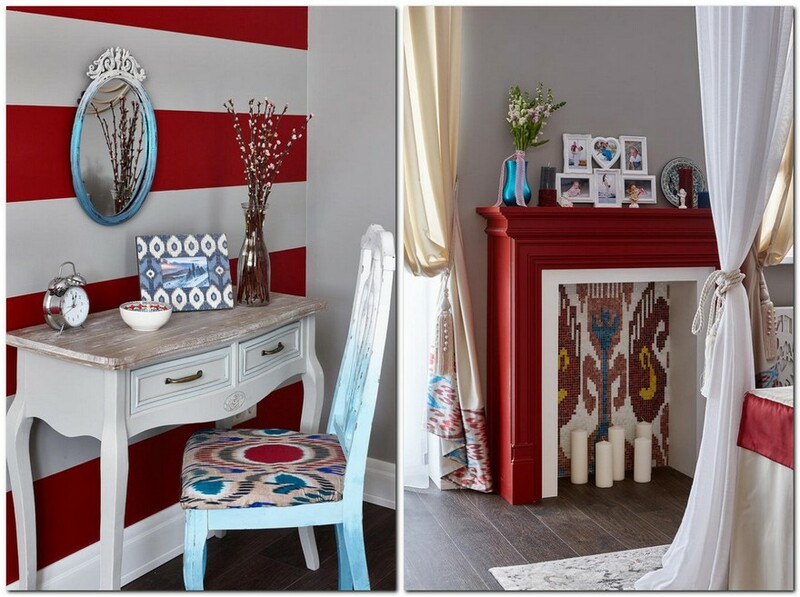 The same bluish gray gradient was applied to the mirror and the chair by the dressing table – they were initially in this room and Hanna just re-painted them to fit into the new interior. But the most favorite detail of the interior designer is a canopy: it not just enhances the sense of oriental magic, but ensures more privacy for the spouses with five kids.